Many say yes and yet there is no consent/Many are not asked, and many consent to the wrong things. "He who says yes/ he who says no"
In this 14th year of its increasingly heady success as an international forum for the showcasing of documentary film, Docaviv, the Tel Aviv International Documentary Film Festival, presented a politically complex program of engaged Arab world, Israeli/Palestinian, and social activism cinema, foregrounding a year of restive and often bloody popular uprisings and ongoing conflict in the region and farther afield. Over 35,000 people attended the festival, which showcased 92 films from 34 countries, including Palestine, Egypt, Syria, Yemen and Dubai. The difficulty of even bringing films from the Arab world to Docaviv is articulated by artistic director Sinai Abt: "I offer my card. Everyone is cordial. I ask, ‘Would you present your film in Tel Aviv?' Systematically, the answer is ‘yes,' and then it is ‘no.' "
and confused by this act. It was, Khatib recounts, "more powerful than killing a solider." Vetter told this story in his critically acclaimed The Heart of Jenin (2009). 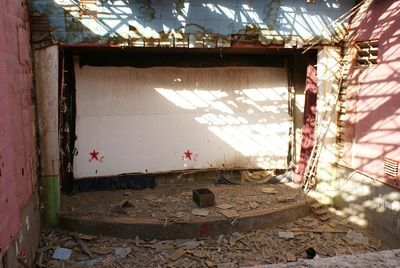 So by the time he returned in 2010 to film the attempt to bring back cinema to a city in which the occupation had virtually erased cultural activity, Vetter was a de facto son of Jenin. clear now, it will be harder later." Vetter, who appears in his film, initially believes that every misunderstanding was once an understanding, and that cinema can foster change--until a moment in a public forum he is moderating, when a radical Palestinian colleague matter-of-factly pats the pocket of his jacket and says, "I didn't abandon my gun. I still have it. Yes, it's wrong to carry weapons. That is why I conceal it." That moment, and Vetter's stunning response, is worth the film. like the fact that I was showing the film in Tel Aviv. I know, however, that there are a lot of people in Jenin who would do the same. It still needs time." Timing is crucial in Sean McAllister's The Reluctant Revolutionary. 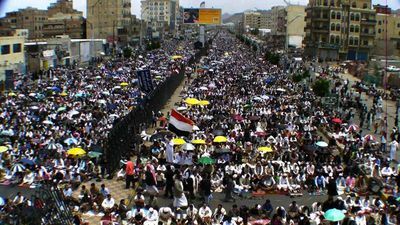 If you happened to get to Sana'a, Yemen at the right moment, you hit the uprising. But who went to Sana'a? While the world was focusing on the Arab Spring in Tunisia, Egypt and Libya, McAllister, though sensing that Yemen might be next, traveled to Sana'a as a video journalist/filmmaker specializing in extreme tourism. In the slowly paced beginning of the film, McAllister's Yemen, the poorest and most heavily armed country in the Arab world, is rather National Geographic. The change, when it comes to "Change Square," is sharp and fierce: The Friday of Dignity Massacre. The protesters are singing "My heart beats to the tune of Yemen" when shots are heard, then sirens, then screams and shouts of fright, hysteria and trauma. McAllister says quietly, "I don't feel comfortable anymore." But it's too late for that. The camera shudders and sways to the rhythm of escape. Sana'a is now a night city of dark and filthy alleys, with IVs dangling in rows at the side of the road, waiting for the bodies. The Reluctant Revolutionary takes us into an urban triage hospital for a riveting, up-close view of blood streaming on tile floors, open wounds and the moments of death, doctors shouting past the camera, then acknowledging it numbly: "I don't know what to say." Israeli director Irit Gal's White Nights follows a group of Palestinian women night after night as they crawl through the wire fencing beyond the Dheisheh refugee camp near Bethlehem. . What would take ten minutes by car takes four hours of clambering over rocks to reach their day jobs cleaning the houses of Israeli families. We never see these families. We only see the night, the dawn, the scrub brush, the security wall that separates the occupied territories from the city of Jerusalem. These women are without permits, though each has tried again and again to obtain one. They've been working for Israeli families for years, but since Israel constructed "the wall," the labor of getting to work has become tortuous. Palestinian construction workers cross as well, but they sleep the week in the buildings they're raising. Women would not be tolerated sleeping outside their homes. Though fearful, they clearly walk on their native terrain; they know path, road, rock, olive grove. When Israeli soldiers the age of their children suddenly appear shouting into their walki-talkies, the women scurry back down the hill, palms up, praying aloud. their headscarves, the better to blend in. No longer Arab women, just early-morning working women, they carry plastic bags with Israeli logos. When they arrive in the Jerusalem neighborhood, other early morning women in brightly colored sweat suits are out walking their sleek dogs. This is one of the most illegal films ever made, says producer Nurit Kedar. "We were not allowed to be there filming, not allowed into the territories, the women were not allowed out. We could never get a travelling shot, the women would never let us near their homes." In the end White Nights is richer for the ways in which it has been constrained. 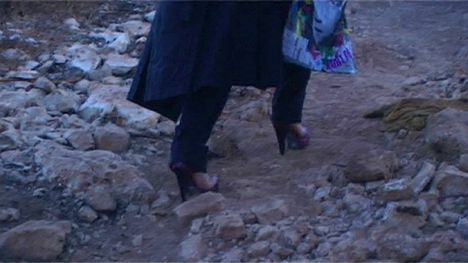 In the unbearable pain it shows of women crawling, and shedding culture and clothing to "pass," the film becomes a parable of the triangle of interdependence linking power, injustice and art. When Kedar and Gal pitched White Nights to an audience of filmmakers and producers in Europe, they angrily accused her of being complicit: "How could you make this film? You are not Palestinian" Gal responded, "Of course, Palestinians should tell their own story. But where we as Israelis are responsible for the situation, we bear the responsibility as well for documenting the story, for ourselves and the world." If there is a glimmer of hope in White Nights, it is when the camera is finally allowed to show one child asleep, his mother, her back to us, stirring the cocoa she will leave on the stove for him when he wakes and she is already walking--one of the opportunities for us to regard, as Susan Sontag puts it, "the pain of others." Annabelle Winograd is an arts critic, curator and Visiting Scholar at Dartmouth College. She lives in Tel Aviv.